Ruddy Good Theatre, Whether You Like It or Not! You know what they say: April Showers May Bring Theatre! Or...something like that. Either way, we have more theatre news in the upcoming weeks than you could shake a stick at. Several sticks, really. And we're gonna start the moving and the shaking by introducing Ruddy Productions! Born of a group of Meisner-trainted students of Maggie Flanigan, Ruddy Productions is beginning its journey in the New York City Theatre scene with a New Works Festival like you wouldn't believe! It's coming to you from Midtown, and we have all the details below. Ruddy Productions may be new, but they're already swimming in new works. For their upcoming festival, they received over 400 submissions from artists all over the world! Only a few were lucky enough to be chosen, but we've been assured that they are the best of the best. Join them (and us!) at the John DeSotelle Studio from June 6th to June 15th to see the newest new theatre your eyes have yet beheld. Did we mention that the purchase of a ticket includes a free beer or glass of wine? Because we should have. That's pretty much a guarantee that we'll be somewhere. As usual, the links are below and also scattered throughout the above article! Go ahead, give 'em all a click. Ruddy Productions is also in the middle of fundraising via Kickstarter. We at Hamlet Isn't Dead remember those days and know how nerve-wracking it can be. So if you can spare anything at all, please click on over and help them out. Not convinced yet? Listen well and you will be! You will be! To Like Ruddy Productions on Facebook, click HERE! To Help them out via Kickstarter, click HERE! And, no, seriously, help them out on Kickstarter. DO IT! 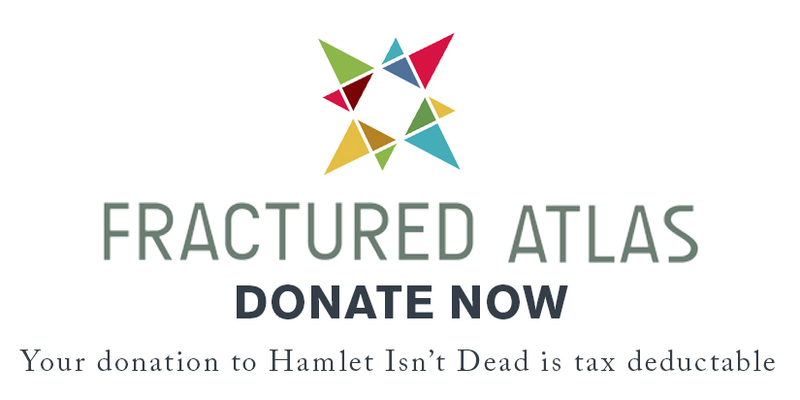 As always, thank you for reading about, listening to, Liking, Following, and generally supporting Hamlet Isn't Dead! And if you only fall into one or a few of those categories, it's not too late to take it up a notch! And if you or anyone you know feels the need to join us on an episode of Tales Told by a HIDiot (the world's 59th greatest Shakespeare-related podcast), e-mail us at hamletisntdead@gmail.com and we'll save you a seat!